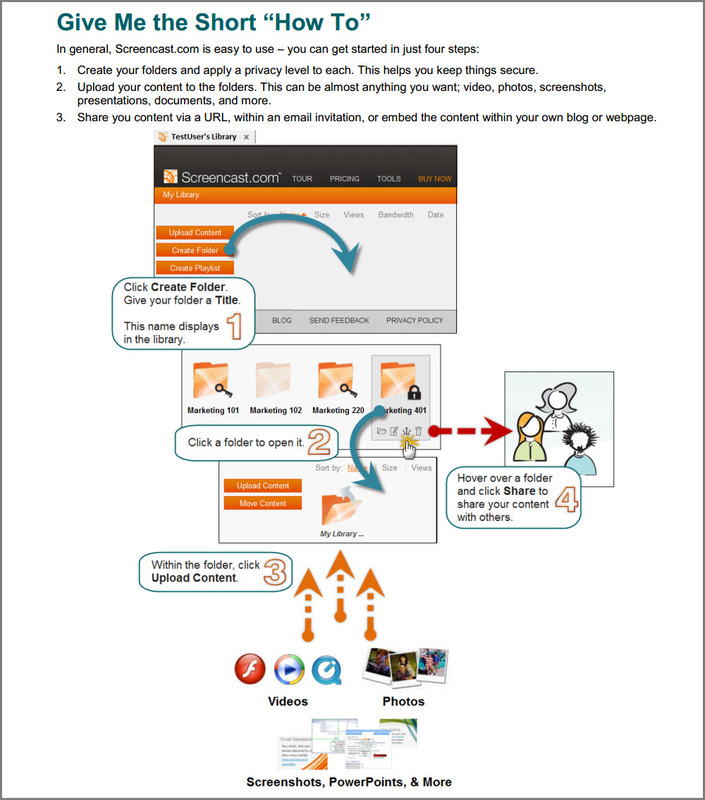 Screencast is an online service that lets people “manage and share videos, images, documents, or anything else online.” In its Help Center, Screencast has more than a dozen how-to guides, including a succinct Getting Started Guide. Anyone who has video. images, documents, PowerPoint presentations, and similar material that they want to share online. In a hurry? Four steps to sharing. That’s it–the basics, on a single page. One aspect of the detailed how-to is the way it handles screen shots. That example you just saw of the first page includes an image of the full-screen library on the left, then a closeup of the Edit Folder window. In other words, they’ve cropped unnecessary detail out of that second image. They continue in this leave-things-out mode. 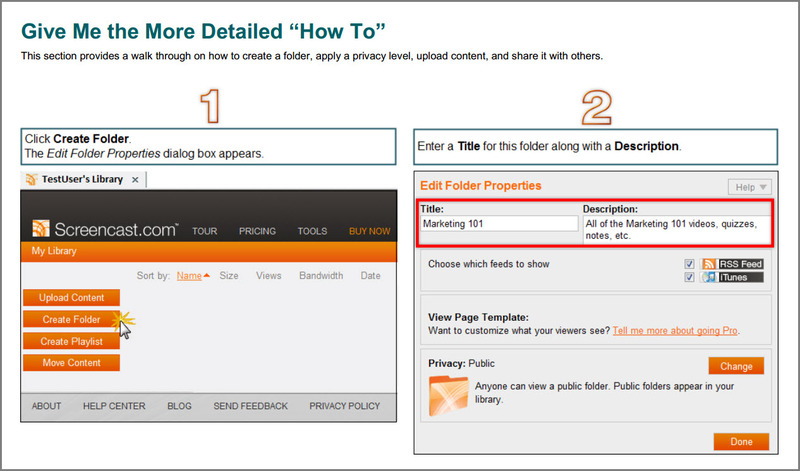 For example, to help you decide how you’ll share, they crop to only the Privacy section of the Edit Folder. My take is that they’re focusing your attention on just that section, and omitting anything you don’t need to see while you’re deciding on the level of privacy for the content in this folder. Some people might find this a bit harder to follow than full-screen images, but I think such images are often hard to follow in themselves. They’re small (in order to fit on the page), and typically they’re needlessly cluttered with detail that doesn’t directly relate to the step I’m performing. Careful weeding of detail is a way to rely on the performer’s intelligence and his interest in accomplishing the task. A two-sentence overview followed by a three-line summary, and you can figure out what’s in the Guide. The bullet points of that summary do double duty; you can see them as a miniature decision table, helping you decide which part of the Guide you need to use. The page has a table of nine “terms you should know” — content, embed, library, and so on — that relate directly to uploading and sharing via Screencast. As a job aid, that table falls into the reference category; you’d use it to learn or remind yourself what “breadcrumb” or “RSS” means in the context of Screencast. Overall, though, I’d put the Getting Started Guide into the procedure category of job aids. Finally, still one page 1, there’s a box listing other resources, like the Help Center, two other guides (one with “end-to-end workflow” for using Screencast, and an “example case study“). Screencast is a TechSmith product, as are SnagIt [for screen captures] and Camtasia [for screen recording and video editing). Screencast comes in two flavors: you can get a free account (2 GB of storage space and 2 GB of monthly uploads), or a pro account with much more space and several additional features. I’m grateful to TechSmith and to Natalie Ebig Scott, their Global Public Relations Manager, for agreeing to have the Getting Started Guide appear here in the Ensampler. Just want to get emails with your posts. Great stuff!